The application LINKS_DEMO offers the opportunity to search for persons in the marriage certificates of Groningen and Drenthe from the 19th and early 20th century. The application was made by Marijn Schraagen, Leiden University. The search is started when the user enters the name of one or two married persons. The programme will search for their parents, grandparents as far as certificates are available. The results will be shown in the form of a pedigree. It is possible to navigate in these pedigrees to get the information of related pedigrees. For the searching it is not necessary for the names to be spelled exactly the way they were written in the marriage certificates. However, the better the names correspond to the ones in the certificates, the higher the chance of 100% results. By clicking on each presented married couple more information from the certificates will be shown such as the date and place of the marriage. Sources for this application were the indices from the marriage certificates constructed by volunteers within the context of the WieWasWie project. We thank Drents Archief and Groninger Archieven for the willingness to disseminate their data by way of this application. This application was made public on the occasion of the Famillement 2014. 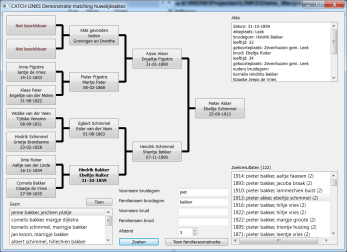 The application is part of LINKS, a project to build a LINKing System for historical family reconstruction for the Netherlands and financed by CATCH (NWO). You may download the application (.zip file, 135 Mb) from here. Instructions (in Dutch) (.docx file) how to install and navigate the application are included in a text file can be downloaded from here.